A yellow will be to big and quick for your tank next time my Yellow is having one of his nutty moments belting up and down my 6x2x2 ill try and get a video you will then see just how quick they move and the space they need. Also bear in mind a Tang needs a varied diet and they eat a lot in my opinion here is what my tank gets fed not all at once obviously but alternated. I always have Nori and a Grazer ring in the tank to keep them occupied as well as fed. So your filtration system need to be able to deal with the food going in and the waste coming out a happy fish is a well fed fish. 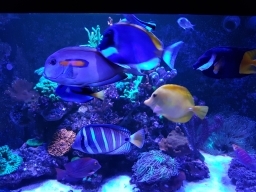 There is a vid in my tank log showing feeding time that will give you some idea how fast the tangs are but as said above when the yellow next having a nutty moment ill try get a video of it. Based on this comment, you've no guarantee of getting a bigger tank soon, or ever. Until you get that, don't buy a yellow tang (or anything else that will outgrow your tank). Even those of us with big tanks, have to accept there are a load of fish we can't have. Do the right thing. Sorry mate, I'm with these guys, i bend the rules in this hobby and i have a 180l jewel vision so not much difference in size volume wise and i have more swimming length. a yellow tang is a definite no. sorry bud. just think if you get one, it dies and wipes your tank out it could cost you £100's which you could have put towards a bigger tank. i went with a kole tang (which is the most suitable) and it was never "happy" it would have survived but thats not fish keeping. get yourself a dwarf angel. maybe a lemon peel. they're pretty and quirky and if you're keeping softies as coral I'm sure you will be OK.
One thing i want you to realise is although you may get the tang small it will suffer from stunted growth, may deform its spine and will rapidly reduce its life span. as it gets bigger it will become more aggressive to all the other fish and will be very agitated. Just think if you started of having the whole of the UK to roam about in and then i confined you to a house. That would be stressful enough. you're now wanting to confine it to a cupboard. please look at bicolour angels, lemon peel angels, coral beauty, flame angel. Much more suited. Still pushing the rules a little but I'm sure they will be fine as long as you keep on top of water quality. It says 70 US gallons = 318 lt minimum. That's the main tank volume. Agree. The fish might be fine for a while, but when it gets close to full size, it's not going to have the swim space it needs. FLame angels are known to get aggressive, and I imagine that's made a lot worse when it's in a tank that crowds it. I'm going to go with the grain and say you would be OK with a flame angel as long as your stock levels aren't stupidly high and you have plenty of swimming space and things for it to swim around in. you must also make sure it doesn't have anything else which will want to boss over territory. 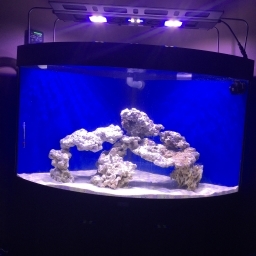 I have a coral beauty in my tank and had it a year and its the boss of the tank. its full size (just over 4") and has plenty of space to cruise about in. The flame angel is the same size and has a similar temperament to a coral beauty although more prone to munching corals.